Of intermingled Mexican, Native American, and Anglo heritage, Dominguez grew up in Fort Worth, Texas, where he also spent his early adult years. He was exposed to art and artists early on through his father, a freelance commercial artist. After finishing high school, he completed courses in design, illustration, and art history at Texas Christian University, but left without a degree. He then taught himself the craft of commercial sign-painting and established himself as a freelance sign-painter in his hometown. After moving to New York on a whim in 1987, he supported himself by working for graphic-design and commercial-sign companies until he dropped out of the workaday world. Instead of considering himself homeless, Dominguez proclaimed himself free. Liberated from the constraints of a job and financial obligations, he pursued his life as an autonomous individual, conceiving and rendering original images to transmit subversive ideas and messages often tinged with humor. During his years on the streets Dominguez developed and refined a signature style of imagery dominated by interacting figures- people, animals, insects, birds, and the grinning, animated skeletons that are often principal players in his one-scene visual tragicomedies. His visual narratives are sometimes accompanied by brief, cryptic texts – and, in his later works, passages of musical notation with original handwritten lyrics. For years he worked exclusively on black fabric, using white paint applied in even lines, before reversing the equation to black-on-white. His paintings are essentially painted line drawings that he composed as pocket-sized preliminary ink sketches. During his last few years he began introducing areas of red into his paintings. The streets and sidewalks of New York provided Dominguez with the fabric scraps and other materials he used to make his art. His imagery underwent pronounced stylistic evolution over time, growing sharper and more precise as he experimented with different painting implements. He devised some of his own tools for art-making, and he made a wooden flute that he used to teach himself musical notation, enabling him to compose and play the brief songs incorporated into some of his late works. The New York streets were an endless source of subject matter, too. His daily experiences roaming the city and observing the life around him served as a primary inspiration. Much of his work emphasizes the inevitability of death, the constant presence of death in daily life, and the yin-yang relationship between the two. Dominguez typically “signed” his works with a tiny vignette that shows a stick figure opening a door, usually placed in the lower right corner of his paintings. After several years he modified this pictograph by adding a Valentine-heart symbol to the open door. Sadly, Dominguez brought his prodigiously creative life to an end shortly before his 54th birthday. His body was found on April 20, 2014 – Easter Sunday – hanging from a tree in the New Jersey woods, about 70 miles west of New York. 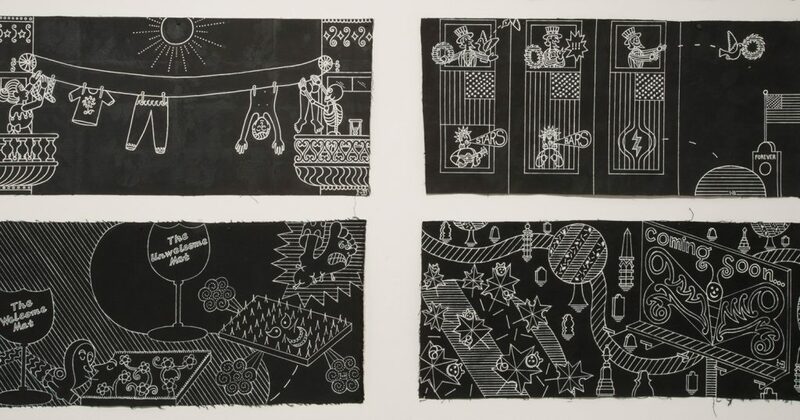 Anthony Dominguez was an outsider by choice, and his work was typically shown in outsider-art contexts when it was shown at all, but his past history of commercial-art studies and practice complicates his identification in these terms. This exhibition attempts to bring Dominguez’s work the broader attention it so richly deserves. Tom Patterson has been writing about art and curating exhibitions since the early 1980s. He is the author of St. EOM in The Land of Pasaquan (Jargon Society, 1987), Howard Finster: Stranger from Another World (Abbeville Press, 1989) and Contemporary Folk Art: Treasures from the Smithsonian American Art Museum (Watson-Guptill Publications, 2001) His writings have appeared in magazines including afterimage, American Craft, Aperture, ARTnews, Art Papers, BOMB and New Art Examiner. A former U.S. editor of Raw Vision, the London-based international journal of outsider art, he currently serves as a U.S. editorial contributor to that magazine. As a curator he has organized shows for institutions including the American Visionary Art Museum, the High Museum of Art, the Southeastern Center for Contemporary Art, the Terra Museum of American Art and the Center on Contemporary Art. He lives in Winston-Salem, North Carolina.